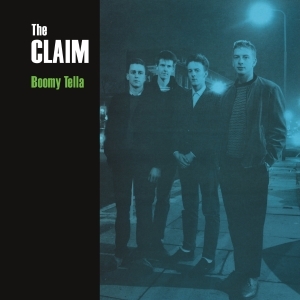 Can it really be more than thirty years ago that The Claim’s Boomy Tella LP was released? Decades have flown by, but a record I’ve consistently listened to for (considerably) more than half my life now seems to exist outside of time passing. This is the beauty of a favourite recording – its magical moments are frozen, not in aspic or ice but in some living, breathing sense, whether the overriding feeling is upbeat or downhearted. The distinctive first few beats and bars of Not So Simple Sharon Said sound out, and those intervening decades drop away. I could be nineteen again, and tapping my foot to them at The Falcon in Camden, or smiling as John Peel plays the song for the first time on the radio. Every note remains familiar to me. It’s hard to step back and attempt to appraise it afresh, let alone objectively. But this is what the reissue of Boomy Tella on A Turntable Friend Records is suggesting I should do. What David Arnold’s touchingly humble sleeve notes (‘This was nearly our great album’) tell me were ‘cheap rattling drums’ and ‘replica guitars’, still sound as thrillingly rich to these ears as they did when I first heard the LP in late 1987. And the remastering has put a little more boom into Boomy Tella, with Stuart’s sure-footed bass playing in particular coming through more clearly than I ever recall it doing on my old vinyl. The songs are simple, yet surprisingly sophisticated. The singing is heartfelt, yet lyrically speaks so often of doubt. Uniquely, the music mixes the bloodlines of mod pop and English folk song, but much less consciously than that might suggest; while the Claim would have been entirely au fait with the Jam and the Style Council, I don’t imagine David Read had heard much if any folk music before recording Boomy Tella, and yet if you heard it a cappella, his unaffected singing voice might easily lead you to place him within the tradition of English folk song. I love the way it’s finely balanced. The way it’s sinewy and substantial but understated and light on its feet. The way there’s something to get your teeth into but something you can’t quite put your finger on. The way it’s so English like Ray Davies, Vic Godard but altogether strange somehow. The way I keep coming back to it like a tongue always comes back to a loose tooth. Most of all I love the way Not So Simple Sharon Says starts as much as I love the way Waterloo Sunset starts. Boomy Tella’s cover may have been deliberately artless, but that continues to conceal an artful, inventive approach to songwriting. Guitars are picked, strummed, and struck into modernist shades of red and blue, while bass and drums form a rhythmic backbone that is indeed foot-tapping in its simplicity. Over the top David Read weaves a lyrical sense of the absurdity of the everyday into those folkish melodies of his. On one level the group are mates having a laugh, incidentally producing consummate moments of pop music like Beneath the Reach. On another, they’re gifted poets telling it like it is, playing it how they feel it, and coming up with something of the emotional heft of Down By the Chimney. The Claim achieved a marriage of unforced exuberance and subtlety that set them apart from the majority of both the independent music of the era and the Britpop that was to follow. Where might the Claim be now if they had had the time, space and money to plot a course through the ’90s and beyond? As with so much artistic endeavour, the what-ifs are legion. Live, the Claim were both engaging and inspiring – and having seen them play again last weekend at the 100 Club, I can report that they still are. For me, no other group of the time and type combined serious musical intent and a sense of ease and enjoyment better than the Claim did at their best. Davids Read and Arnold would introduce what were obviously carefully composed and cherished songs with carefree good humour. Odd rhythms and jazz inflections, indeed odd touches all round, informed what would otherwise have been straight-ahead pop. Dave Arnold held his guitar high against his chest, and the unconventional playing style contributed to the choppiness of the sound. Thanks to the expressive range of Dave Read’s wonderful, lilting voice, the Claim could be both irrepressibly upbeat and as blue as Miles, though cheerfulness would keep on breaking through. The Claim tried not to let their lack of acclaim get the better of them. They kept on keeping on, playing shows to a small but devoted following, putting out great singles, but eventually, inevitably, there came a period in the early 90s when it must have felt like the returns were ever-diminishing. And so they called it a day and got on with their lives, until the time was right to regroup and – as they say in football after a defeat – go again. The freshly remastered Boomy Tella comes with a quartet of extra songs: a Jam-my demo of the later B side, Business Boy; an equally robust rendering of God, Cliffe and Me; a fabulously lively take of live favourite Fallen Hero; and an untitled northern soul stomper that I don’t recall ever hearing. It’s all great, and my appetite is well and truly whetted for the group’s new material, especially having heard a handful of the new songs live. It’s due to appear in album form come May. The title? The New Industrial Ballads. The expectation is that they will be at the very least on a par with the old industrial ballads of Boomy Tella. 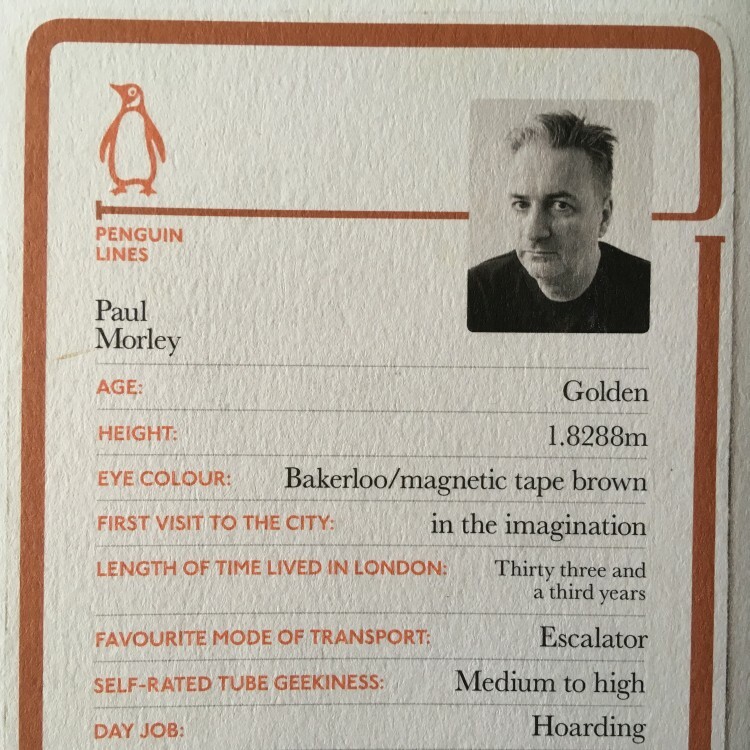 There’s plenty on the experience of travelling underneath the city too, as well as working for the NME; possessing one of the first Sony Walkmans in London; and interviewing Mick Jagger and ‘punkishly, pompously telling [him] off for being too old, at thirty-seven, to be singing pop’. 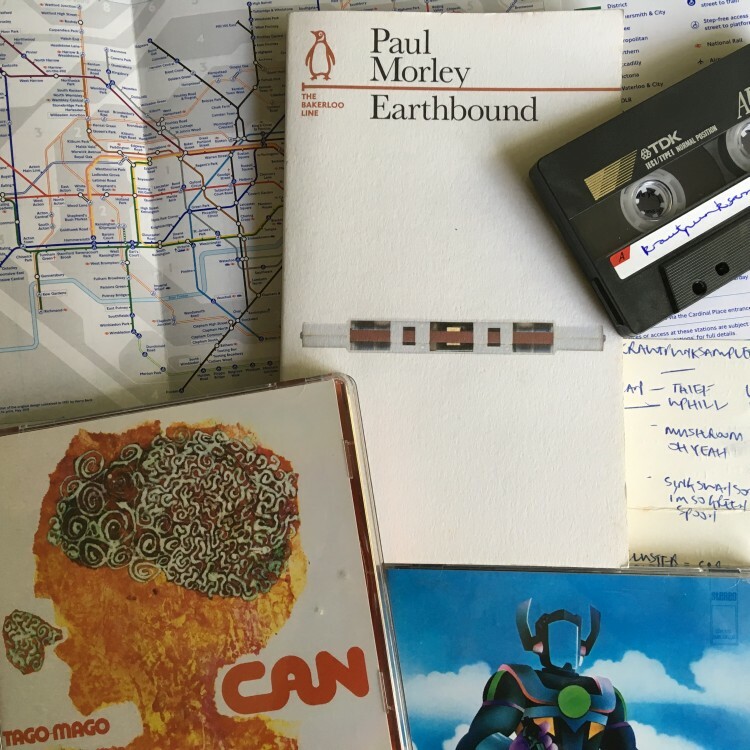 The comparisons of Brian Eno’s music with Harry Beck’s London Underground map, then of Googling and using the Tube, are typically bravura Paul Morley, not so much spotting patterns as forcing the cultural world to bend itself to his vision of it. If Words and Music: A History of Pop in the Shape of a City felt at times like too much of that vision for an ever so slightly less pop-obsessed reader to cope with, then Earthbound’s focus and (relatively) contained and constrained subject matter make it an always engaging read. 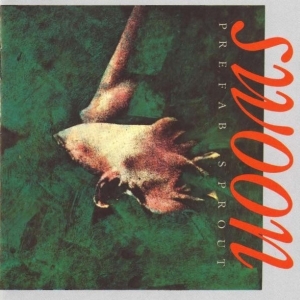 I first heard Prefab Sprout on a cassette that a school friend made for me. Tibor put Swoon on one side, and the Pale Fountains’ Pacific Street on the other. Songs Written Out Of Necessity soon became songs listened to out of necessity. I used to sit next to Tibor in maths; he was of Hungarian origin, and his family ran a restaurant in town called the Silken Tassel. I don’t know what became of him after we left school. He could almost be a character with a walk-on, walk-off part in one of the more nostalgic songs on Swoon; ‘I never play basketball now’, say. Today, I more readily associate the Swoon-era Prefabs with the word-heavy, melodic alternatives provided by early Del Amitri and Microdisney than with the Paleys. Because of the relative maturity of Paddy McAloon’s song craft, you could tell that the Prefabs had greater commercial potential than any of those groups, and eventually – four years down the line – Paddy’s ship did indeed come in, in the form of ‘The king of rock’n’roll’. But there were three long players before that moment, two released and one rejected. After all these years, and prompted by a friend who’s been retrospectively puzzling over Swoon like a dog gnawing away at a bone, I think it’s time for me to square up to each in turn, starting with that first LP. That absurd, prog-sounding name. It’s like those early automatically generated internet passwords which paired two random words. Yet at the same time, it suits, as does the fact that the group contained a pair of McAloons, brothers who appear to have lived a rather Danny the Champion of the World childhood a little way outside of the cathedral city of Durham. It’s no accident that ‘Cue fanfare’, which is gently nostalgic in the verse, tips into a bright and blaring celebratory chorus about chess grandmaster Bobby Fischer. When Paddy sings, ‘He’ll take those Russian boys and play them out of town’, he is surely signalling that it is his ambition to be a songwriting grandmaster. And who could deny that he became one? On ‘Green Isaac’, the singing takes centre-stage, as Paddy’s grown-up choirboy is ably and ethereally echoed by Wendy Smith’s complementary backing vocals. Not just on this album but those to come, Paddy’s vocals would habitually be lain on the soft mattress of Wendy’s, as she double-tracks many of his lines. The song seems to concern the lot of a songwriter naively setting out on his journey ‘to be someone’. Perhaps Paddy is looking back and seeing himself as Green Isaac, ‘still wet behind the ears’. For ‘Here on the eerie’, presumably Paddy meant to play on the word eyrie; the title works either way. He voices the dilemma faced by any artist – by any person in so many walks of life – between choosing what is safe and comfortable and unthreatening and normal, or deciding to take the first in an ongoing series of risks, and put yourself out there where there is no safety net, no comfort blanket, and always plenty of threat; a place where you decide what is normal for you. ‘A universal prescription continues to elude… Face yourself or give it away.’ The complexity of the dilemma is underscored by the choppy challenge of the music, and the plangent, questioning critique posed by Paddy’s lead guitar late on. It expresses a very down to earth sociologists’ approach to rock, expressing a very basic human feeling. Music can do little more than tell narrative tales about things that are happening. I think you can go beyond that — the difficulty is when it starts to become too vague. You can describe things in another way from that journalistic/sociologist approach. I like to score between the two — I like things that leave you with a strong emotional sense. The correspondence between the words and the real world. Our songs don’t have a definite message — you have to look much deeper. Just how odd is the intro to ‘Couldn’t bear to be special’, with its choral ‘bo bee’s? Again, it’s like nothing else before or since. Paddy’s vocal goes on to be gently argumentative, until suddenly he unleashes a whole load of pent-up angst that on top of ‘Cruel’ gives you to think that, at the time he wrote these songs, to love or be loved did not come easy for the songwriter. The song also features the line ‘Words are trains for moving past what really has no name’ which only adds to the feeling that despite all of his undoubtedly erudite efforts, what Paddy is reaching for is frustratingly out of his grasp, as by definition the ineffable must always be. ‘I never play basketball now’ starts in a deliberately humdrum fashion before bursting to life with inspired chord progressions and changes of pace. Lyrically, it’s a slam dunk elegy for lost youth, and an evocation of what we all lose as we move from childhood into adult life. Basketball ‘joins the list of things I’ll miss like fencing foils, and lovely girls I’ll never kiss,’ sings Paddy, and we may never have fenced, Paddy himself may never have fenced, but we instinctively know what he means, and I certainly knew and felt it then, in 1984, a time when I was starting to make my own transition from childhood to adult life. A cheery, whirling Wurlitzer keyboard line meets a bubbling, burbling bass in the uptempo of ‘Ghost town blues’, where listlessness meets meaninglessness and death, and ‘we’re all caught in history’s web’. The prolific songwriter concludes, ‘Perhaps I should learn to shut my mouth.’ No chance of that. ‘Elegance’ is the very definition of its title, with its piano (rather than the cheaper keyboard sounds elsewhere) and its clipped, killing couplets; elegance here is aligned with ownership of the world, while, in contrast, kid, you own nothing – but don’t be seduced by silver service or salvers, because real life and real loving happens out of the purview of those with money and property. Meanwhile, the narrator of ‘Technique’ appears to have lost out on a woman’s love to the astronomer she has married, and he’s upset because scientists’ eyes ‘don’t fill with wonder when you speak’, and yet at the same time, he’s all too consciously aware of his own intellectual limitations when in her presence. The scientist is unmoved by beauty, and the artist, too moved to make sense. Despite this dim view of scientists, I think we can infer both from this narrator and subsequent star-referencing releases that if he was not intent on being a songwriter and perhaps a pop star, Paddy would have liked to be an astronomer. If we add that his schooling was within the cloisters of a Catholic seminary, then we could say that he chose art over both science and religion. Art which he saw as a craft; a technique, indeed. With the choice resulting in songs as beautifully realised as this – propelled particularly by Graham Lant’s brilliant drumming – music’s gain is God’s and science’s loss. Proceedings conclude with the second part of ‘Green Isaac’ and in this coda, there is a warning: only fools reach for the moon or the stars. But our sense is that the singer is bound to shoot for the satellite anyway, in what appears to him to be that necessary attempt still ‘to be someone’. 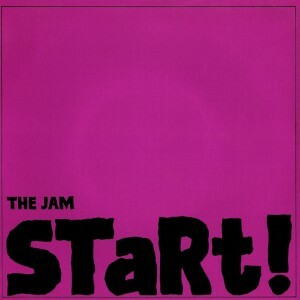 Thirty-odd years after its release, the album leaves me with two abiding (and not unconnected) impressions. One is of a character who has already discovered that love is rarely simple and often imbalanced in some way; the songs feature characters who want to love, but fear failure, and perhaps are struggling to admit anyone to the fortress of the heart, finding fault with an elegant woman for being too elegant, a loving one for loving too much, a beautiful one for being too beautiful, and so on. The second is of a powerful and complex artistic intent. Swoon is definitely a statement, although it voices too many doubts and contradictions to be taken for a manifesto. Someone with that kind of artistic vision is likely to find love difficult, because both are states which attempt to subsume and subdue everything else that might be deemed important. Swoon is the sound of art and love clashing. On Steve McQueen, a more relaxed songwriter would emerge, one less troubled by the anxieties to be found within Swoon’s grooves. And I would hazard a guess that like many people at a similar age, it was not that Paddy stopped having more questions than answers, but that he began to accept that such answers as he had were good enough to work with, and that perhaps some questions weren’t ever meant to be answered in the first place. With thanks to Sproutology for its comprehensive archive of interviews. You can find further details and photos here. If you’re interested in getting hold of a copy, let me know via A wild slim alien’s First contact page, and I’ll pass on the relevant information just as soon as I have it from Tim. 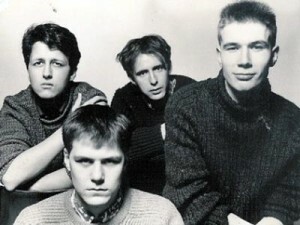 Ever wondered whether there might be a cache of unreleased Del Amitri songs dating from the seemingly fallow period between the release of their eponymous debut album in 1985 and their reinvention as the rather more adult-oriented proposition which culminated in their second LP, Waking hours, in 1989? Well, there is. Not so long ago, I came across a reissue of Del Amitri’s first single, ‘Sense sickness’, in my local record shop. The artwork included a set list with titles to a couple of songs I’d not heard before. Online research led not to those songs, but to a blog post from 2010 by my Firestation Records friend Uwe about the Dels’ lost second album, and a link left in the comments to an extremely low-fi download of the songs he mentions, plus one or two more. And then, on a hunch and a quick google to – miracle of miracles – much better quality YouTube uploads of the songs. Even if the songs don’t quite match up to those on the debut album (which I wrote about here), its admirers will find much to like and perhaps even love in this lost second album. 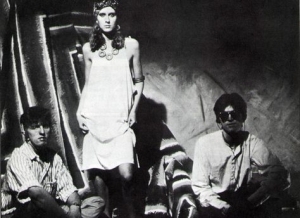 In fact, the more I listen, the more I think these unreleased recordings merit comparison with the (once) lost early demos of Hurrah!, or the shelved post-Steve McQueen Prefab Sprout album which finally saw release as Protest songs, after Paddy and the gang had temporarily become the kings of rock’n’roll. Save for ‘Nothing goes accordingly to plan’, which crept out at the time on the ‘Abigail’s birthday party’ cassette-only compilation, they’re roughly recorded and nothing like as detailed or filled out as the songs on Del Amitri, but the sparseness serves to differentiate these recordings, and makes you wonder what might have been had they been taken into the studio proper. That they were not quite of the same refined quality, or that they didn’t move the group forwards quite enough might be reasons why that never happened, but this cache still feels like long-lost treasure now found. The ever-shifting guitar lines and vocal melodies of Del Amitri remain a key ingredient. ‘I am here’ starts messily with a mish-mash of double-time instrumentation before settling into something as plangent as anything on the debut, including ‘I was here’, to which with its present tense title this song is surely a sequel. Featuring a vocal full of yearning and a lyric about standing your ground – ‘I am here, right where I wanted to be’ – it shows that singer and songwriter Justin Currie still had an excess of words and emotion to spill. On ‘My curious rose’, a quiet groove is established between the weaving lead guitar and sticks tapping out the rhythm on the side of a snare, a groove from which the chorus joyously bursts forth. ‘Tall people’ is slightly odd lyrically (‘Walk into a hospital and give yourself up…’), but is still another wonderful confection of melody and intricately woven guitar. ‘Tears And Trickery’ concerns ‘an impossible girl’ and features fabulous falsetto and guitar lines quite as jaunty as those on the debut’s ‘Hammering heart’. The set of ten songs ends with ‘The wind in the wheels’, which has the breeziest of choruses and would have made a great double A side with a number apparently not slated for inclusion on the lost album, ‘Out in the wind’. The latter song did in fact see the light of day at the time, though somewhat hidden away on a subscription-only Record Mirror EP. Cleanly recorded, and with initial restraint giving way to a stormy chorus, it offers the best insight into just how good the-album-that-never-was might have turned out to be. 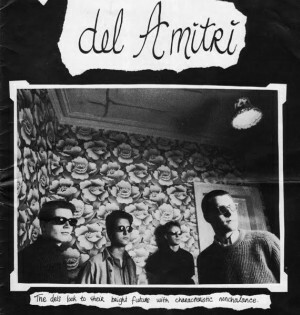 With my taste far broader and more accommodating than it was when I was a ferociously intense and militant teenager, in retrospect I like much of what Del Amitri went on to record in their mature guise, especially the sequence of grown-up love songs that they put out as singles. But if you stipulated that I had to make a cut-and-dried choice between the debut and this lost second album on the one hand, and all of what came after on the other, the teenager in me would still insist on keeping hold of the Dels’ precocious juvenilia every time. 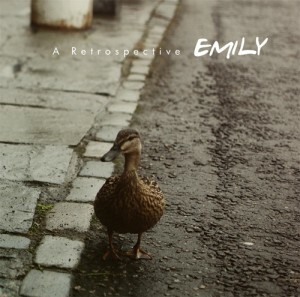 February 5th sees Firestation Records’ release of A retrospective by Emily, on both double CD and vinyl. I was asked to pen the sleeve notes, and happily obliged, what with ‘Stumble’ being among my favourite ever singles, and Rub al Khali one of my favourite ever LPs. It’s the first time on CD for both the single and the album. Expertly transferred from vinyl (as opposed to inexpertly by me, which had initially threatened to be the case) owing to the master tapes being lost, the three songs from the ‘Stumble’ single sound fantastic, better than I could possibly have hoped. Rub al Khali also benefits from the absence of snap, crackle and pop, and remains a thing of wonder, as timeless and out of time now as it was when it was released 25 years ago. If that weren’t enough, A retrospective additionally includes a selection of demos of varying sound quality and excellence, ranging from the group’s earliest recordings through to ‘You don’t say you need that’, a song which dates from long after Rub al Khali and gives a sense of what might have been had the album – not to mention singer-songwriter Ollie Jackson’s talent – garnered the attention it deserved. A number of otherwise unrecorded live favourites also grace the compilation, including ‘Merri-go-round’ in both its early and mature forms, the latter version having been scheduled as Esurient’s follow-up to ‘Stumble’. The track which closes the second CD is another highlight – a beautiful acoustic version of ‘Rachel’, one of the ‘Stumble’ B sides. 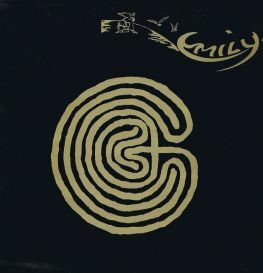 What the compilation sadly lacks is the Irony EP which Emily recorded for Creation Records in 1988, but ‘Mad dogs’ at the foot of this post stands in part to remedy that absence. To further whet your appetite, you’ll also find an outtake version of ‘Foxy’, the majestic opening song from Rub al Khali. I’m proud to have been involved with the putting together of this release, but even if I had not been, I would still be wholeheartedly recommending it to you. Every (Pantry-reading) home should have one. This blog would probably not exist were it not for the Clientele. Their music has sustained me long past the time when I imagined I might still be writing about music in this broadly review-ish sort of way. And this despite the fact that the group once saddled me with an expensive bill – not that they ever knew they had (until now). Out and about in my car one fine spring day in 2007, with the freshly released God save the Clientele playing rather louder than it ought to have been on the stereo, I backed out of a parking space and didn’t spot an already battered Merc doing the same. An unholy alliance of insurance company and the Arthur Daley driving the Merc subsequently saw me stitched up like the proverbial kipper. Masterpiece though it may be, the album ended up costing me considerably more than the £10 I was comfortable spending on it. Ever since, I have superstitiously refrained from playing the Clientele’s music in the car. 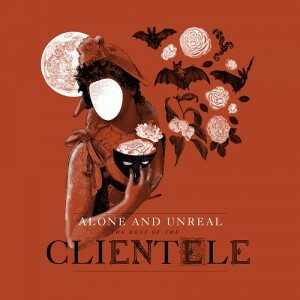 So I’ve been listening to Alone and unreal: the best of the Clientele only while safely sitting at my desk at home, much as I would like to take it with me everywhere I go. When I first saw the track listing, I wondered if the group had been a little parsimonious in selecting only 11 songs – surely it could have been twice as many, and still have given any Clientele admirer acting as compiler headaches as to what to leave off? But upon listening, it becomes clear what has been done, which is effectively to programme a new album out of songs their fans will have played so frequently that they know them inside out. The music from the group’s different phases flows together, individual songs cast light on their neighbours, and the overall effect is to create both a journey through their output and a recognisable narrative. Having realised this, it wouldn’t be fair, would it, to carp on about this track or that being left off. But bloody hell, no ‘Lacewings’? No ‘Porcelain’? No ‘My own face inside the trees’? No ‘I hope I know you’? No… Stop that. Now. The compilation picks a chronological path, which suits their development from songs recorded in a seriously lo-fi fashion to the aurally perfect productions of more recent times. It begins with ‘Reflections after Jane’, which sees the Clientele at their softest; for me, the song is redolent of London in the late nineties. The mood of minor melancholia, the resignation rather than racking sobs at the loss of Jane make for a beautiful piece of music, particularly when a middle eight of a kind arrives and takes this listener through the permeable glass panels of memory and into the precise mood engendered by a turn around Waterlow Park in Highgate, north London, 1999. On ‘We could walk together’ we are again in a submerged, aquamarine sonic world of the Clientele’s own devising. This was the period in which Alasdair used to part-sabotage, part-enhance his vocals by putting them through a guitar amp, making it sound like he was ringing them in from a red public call box (put your nose to the air of these early songs, and you catch the faint smell of piss rising from the concrete floor to mingle with cigarette breath on the receiver). The guitar is crystalline, picking up glints of both sunset and moonlight, and then there are those gorgeous words borrowed from French poet Joë Bousquet: ‘like a silver ring thrown into the flood of my heart’, a line which fits so well with the rest of the song that you wouldn’t know it was an appropriation unless it had been pointed out to you. The mood again returns to absence, loss, and weirded-out isolation for ‘Missing’, the only choice from the group’s first album proper, The violet hour. The song slowly and subtly unwinds, with accents picked out on an acoustic guitar; what for many groups would be a run-of-the-mill album track is transformed through sheer loveliness into a song which can justifiably feature on a ‘best of’. 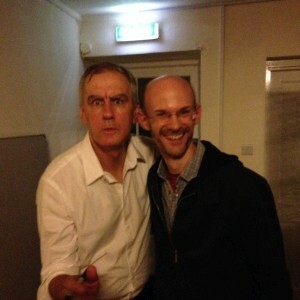 Now comes what I think of as Alasdair’s lyrical and the group’s musical tour de force – ‘Since K got over me’. Musically, it’s the closest we get on this collection to the dynamism that they could generate merely out of guitar, bass and drums in a live setting. Alasdair’s guitar clangs and twangs, James ferments another of his ever-melodious bass lines, and Mark’s drums are as bouncy as the trampoline Alasdair refers to in the lyric. Although this is on the surface a song about the aftermath of a relationship, I’ve often wondered whether the initial ‘K’ was deliberately chosen as an allusion to Kafka’s ‘Josef K’, and so to existence as the author of The trial and ‘Metamorphosis’ painted it. ‘I don’t think I’ll be happy anyway / Just scratching out my name’, Alasdair sings, entirely believably. Then ‘There’s a hole inside my skull with warm air blowing in’ gives us a Buñuel-esque vision of a character continuing to sing even though he’s been shot in the head, to the point that you feel he is actually enjoying the curious feel of the air rushing through the hole, past the remaining bone and matter. The end result is both philosophically provocative and an incredible pop song. ‘(I can’t seem) to make you mine’ marks the moment when the group expanded its palette to include strings arranged and conducted by renaissance man Louis Philippe. The result is the Clientele at their most refined, elegant and stately – you could imagine an airing of this song in Bath’s Pump Room not leading to too many tea cups rattled in horror. Once again, the strings evoke the loss, or rather, the never having gained, as well as ‘the ivy coiled around my hands’. Lyrically, what is gradually being revealed through this particular choice of songs are the existential battles and romantic adventures of the persona inhabited by the group’s singer. Alasdair has consistently espoused a philosophical as well as literary view of the world via the medium of pop music, and Alone and unreal’s trajectory only serves to hammer that point home, both through the choice of those words for the title of the collection, and through the themes which keep on surfacing from first note to last, themes which have also informed the sequence of Clientele cover art which began with Belgian artist Paul Delvaux’s ‘The viaduct’ for Strange geometry and is maintained with John Whitlock’s faceless, de Chirico-esque collage for Alone and unreal. Well now, but here’s a change in the mood, a twist in the plot. ‘Bookshop Casanova’ breezes in with a lyric best summed up by the lines ‘ah come on darling / let’s be lovers’. The strings, the strident drums, and a guitar solo half-inched from the Isley Brothers’ ‘Summer breeze’ only go to enhance the fabulous seventies disco mood. In intent and effect, the end result is not dissimilar to Whit Stillman’s literary take on Studio 54 in his film The last days of disco. By the time ‘The queen of Seville’ comes round, and in spite of its blue lyric, it’s starting to feel like this just might be a tale with a happy ending; the music has a palpable yearning quality to it, and even if ‘it’s gonna be a lonely, lonely day’, at least ‘she sends me roses’. Gentle piano figures and slowly stretched-out limbs of pedal steel underscore the waiting, as do the verses sung under Alasdair’s breath, as if to himself, or his lover, before he lifts his eyes and his voice again to curse his luck. ‘Never anyone but you’ is a thing of perfection, simultaneously sinewy and musically delicate. The character’s mind is still haunted by his surroundings, by phantoms and imaginary choirs – presumably singing these very harmonies, prompting Alasdair to take them down verbatim – but now a chorus line of ‘I can only see you’ continually rings out, giving the song an overriding feeling of almost stalker-like obsession. ‘Harvest time’ manages to be plangent, spooked and spooky – ‘Bats from the eaves go shivering by / Scarecrows watch the verges of light / I hear a choir on the heath at night / But no one’s there’ – and yet somehow also celebratory, in a hallucinogenic, heat-hazed way. An actual choir in the form of backing vocals from Mel and Mark softly and beautifully reinforces this sense of the cyclical nature of life, as well as the philosophical acceptance that ‘Everything here has a place and a time / We’re only passing through’. The most recently recorded song, ‘On a summer trail’, brings the album to a close. To these ears, it does feel a little like an added extra – while it’s a good Clientele song, it’s perhaps not exceptional, like the rest. That said, it may well grow on me the more I hear it, as so many of their less immediate songs have, and besides, it also fits the narrative, concluding the story on the positive, forward-looking note that ‘Bookshop Casanova’ first heralded. The CD comes with a free download of The sound of young Basingstoke, formative recordings which date from 1994, although the group were by then sufficiently inspired to have already come up with early favourites like ‘Saturday’ and ‘Rain’. Anyone who already has a copy of It’s art Dad might be a little bit underwhelmed by Basingstoke, as there are a number of tracks in common, and nothing which really bests the early gems captured on Suburban light. That said, songs like ‘The evening in your eyes’, ‘When she’s tired of dancing’, and ‘From a window’ are well worth hearing again. I can’t help envying the listener who comes to Alone and unreal having heard little or nothing of the Clientele before, because if they like what they hear, then the pleasure of discovering their five albums – so selectively plundered for this compilation – remains open and ahead of them. I’d love to be able to take that journey again, but equally, I’m happy I was along for the ride in the first place. Soon to come is The olde world, unreleased songs and outtakes from around the time The magical world was recorded. The uninitiated should buy the latter; the initiated, the former. But I don’t need to tell them that. 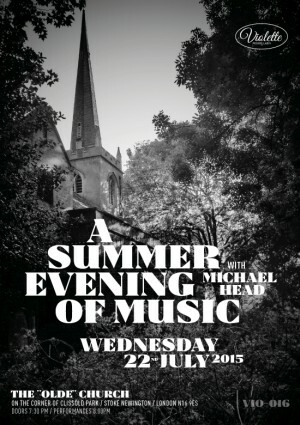 Available to listen to now is Michael Head’s most recent solo outing, at the appropriately named Old Church in Stoke Newington. It’s a captivating performance, even for those of us who weren’t lucky enough to be there that evening. I may not have been writing here much of late, but while I’ve been away, there’s always been at least or song or two in my heart. Songs I would like to talk and write about, songs I want to share. I think it’s time I started doing so again. My 45 45s series which ended last year reminded me how much I enjoy focussing in on a particular song, without the need necessarily to tell a fuller story, or set it in the context of the artist in question’s musical progression (or regression). This new (and inevitably irregular) ongoing series will follow the same lines, but instead of limiting myself to the recto surface of 500-odd 45s, I’m going to allow myself to choose discrete songs or pieces of music from any format, genre, and time. Which already feels like blissful freedom in comparison. Some songs you keep coming back to, wanting aurally and mentally to gnaw at them much as a dog does a bone – because they in turn gnaw at you, get inside your head and your heart, and give you glimpses of life as lived by others, glimpses which may or may not chime with the life you’ve lived yourself. In a way, they are glimpses of perfection – untidy life tidied up into the coherent structures of chords, melody, verse and chorus, the messiness of emotion rendered clear as spring water by thinking, feeling minds – or left deliberately or subconsciously full of that glorious messiness, that disorder or flight of the spirit which reminds us listeners how fully alive it is possible to be. The Lucksmiths’ ‘Fiction’ is one such song. I remember seeing the group play live a couple of times around the turn of the millennium, and found them engaging and enjoyable because of the sunlit Australian warmth they exuded, together with their perhaps nationally atypical tendency towards being understated. I don’t recall them playing ‘Fiction’ on those occasions; I’m sure I would remember if they had, because it’s the kind of song which sticks in your head after just one listen. Coming across it not so long ago, alongside the equally compelling ‘The chapter in your life entitled San Fransisco’, I was immediately struck by its beguiling mix of clever story-telling and wistful sense of what might have been. The song inhabits its title to such an extent that when you are done listening, you feel like you’ve just read the most perfectly crafted short story, a previously unread gem by your favourite short story writer (William Saroyan, say, or Janice Galloway). Sung by Tali White, with lyrics written by Marty Donald, and played by a group whose lyrical sensitivity had been fine-tuned over many years, I feel sure the four and a half minutes of ‘Fiction’ will worm its way inside your mind and heart too, if it hasn’t already. 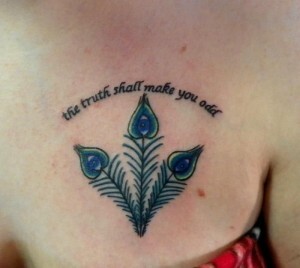 The image at the head of the post is of a Flannery O’Connor quote and was included among ‘25 stunning literary tattoos from books by your favorite female authors’. 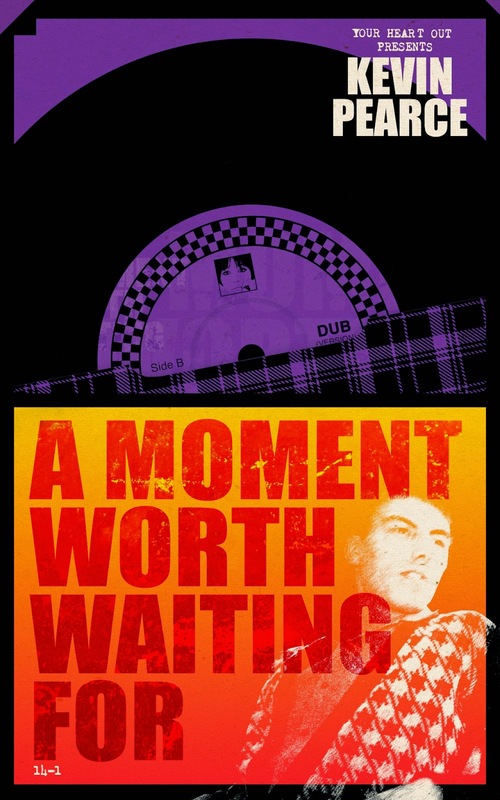 My friend Kevin Pearce has just published A moment worth waiting for as an e-book. It has no subtitle, very possibly because there is no way you could even begin to sum up the book’s contents in half a dozen or so words. But perhaps if you did try, it might read: a young man’s peregrinations through the music of the early 1980s. Except that the young man in question doesn’t confine himself to the 1980s, instead time-travelling here, there and everywhere as he traces lineages back as far as Music Hall and anticipates futures yet to happen. Beginning with Vic Godard, ending with easy listening pianist Peter Skellern (whom Vic used to put ‘on his battered bone-armed record player’), and taking in along the way the ZE, Postcard, Rough Trade, Y and On-U Sound record labels, as well as any number of characters on, around and beyond those labels, it’s as much the mapping of the fruits of an individual voyage of discovery as a detailed account of how that individual made those discoveries – at times through a process of gradual absorption, more often by instinctively and gleefully seizing upon leads from music journalists, as well as the kind of chance encounters or intuitive leaps of faith which result from having a curious mind and a relentlessly hungry pair of ears. In this respect it reminds me of Rachel Cohen’s wonderful book A chance meeting: intertwined lives of American writers and artists, which espoused a similar interest in unearthing what you might call cultural interconnectedness in the pre-internet age. It’s also very much the journey and work of a lifetime. The depth of the research – and / or recall – is amazing; key to the book is the contemporary music criticism upon which Kevin draws, so obviously influential in terms of his developing taste. But those well-remembered moments of discovery are merely the beginning, and it’s the lifetime of subsequent listening and exploration which adds lightly disguised layers of retrospective understanding to each instance of musical epiphany. 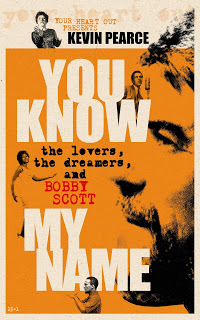 With a cast of thousands and a no limits approach to the genres of music covered, even knowledgeable readers are likely to feel somewhat bewildered from time to time – perhaps there are too many leads, too many clues for any one reader to follow up on – but the tone of the writing remains engaging, generous and sure-footed. 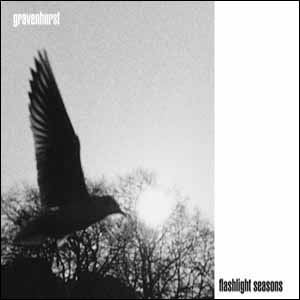 The transitions backwards and forwards in time are likewise handled with ease, and the effect of the whole is to do what any great writing about music should – indeed, what those music journalists of the early 1980s did for Kevin himself – which is to make the reader wish to listen again with freshly syringed ears to the records they know, and make haste to track down those that have so far eluded them. I came away with a long, long list of those. Anyone with an interest in not just independent music of the 1980s, but the entire history of popular music, will learn something from – and find fascination in – every chapter of Kevin’s book. Moments and words worth waiting for, indeed.